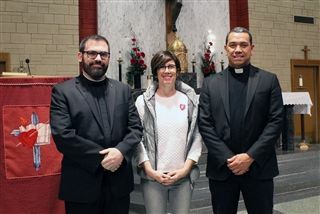 The Commandos Diversity Committee and Campus Ministry Office invited members of the Tulsa Community to speak at morning Chapel about their experiences of faith and how they intersect with diversity. The second speaker in the series was Fr. Elkin Gonzalez who is pastor of Christ the King Parish and Vicar General of the Diocese of Tulsa. Fr. Elkin spoke about the universality of the Catholic Church; the word catholic means universal. He encouraged the students to look around them in their families, friends, and communities to recognize and celebrate the uniqueness of the members who contribute to the common good by sharing their special gifts with others. The Church is diverse with many languages and cultures, but the church comes together in prayer, united in its goal to serve God and each other. Fr. Elkin will speak in MS Chapel on February 19.